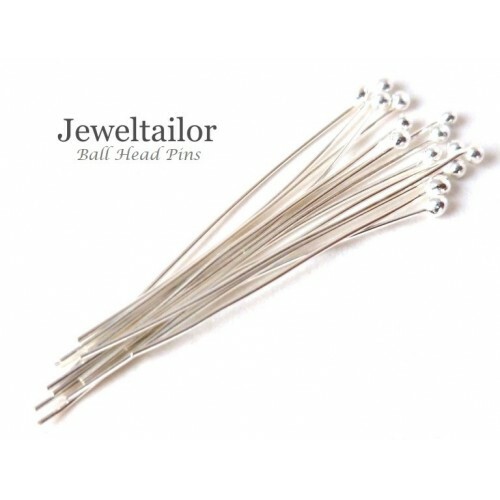 These super straight, silver plated, nickel free head pins, are ideal for creating earrings or any form of jewellery attachment such as pendants and charms. They feature a ball at the end, thereby negating the need for a separate spacer bead and measure approximately 40mm long x 0.5mm wide. Shiny silver plated earring pins are ideal for a range of jewellery making and craft projects and an essential part of any jewellery making tool kit. Now available in a range of pack sizes for even better value. Head pins have many uses; in addition to creating earrings, use them for attaching charms to bracelets or creating focal pendants.The length of these silver plated head pins is such that you can use an amount for example 25mm for the head pin and the remaining 15mm can be turned into an eye pin by creating a loop at one end with round nose pliers.